TH E M R EP O RT | 41 O R I G I NAT I O N S E R V I C I N G A NA LY T I C S S E C O N DA R Y M A R K E T ORIGINATION THE LATEST Buyers Turn to New Homes as Existing Inventory Shrinks HUD/Census data shows single-family sales are down, but demand and new home purchases are on the rise. S ales of new residential units were down in Au- gust from their July num- bers but still came out way ahead of where they were in August of 2015, according to the latest look at new residential sales by the U.S. Census and the HUD. Sales of new single-family hous - es reached 609,000 in August. While this is 7.6 percent below July's 659,000, it is 20.6 percent above August 2015. The drop-off is also slower than it has been the last few months. According to HUD/Census, the median sales price of new houses sold in August was $284,000, with the average sales price being $353,600. "New home sales in August grew strongly and capped the best 12-month span since September of 2008," said Ralph McLaughlin, chief economist at Trulia. 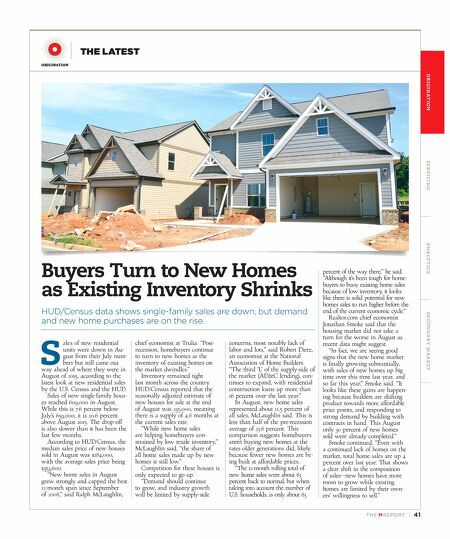 "Post- recession, homebuyers continue to turn to new homes as the inventory of existing homes on the market dwindles." Inventory remained tight last month across the country. HUD/Census reported that the seasonally adjusted estimate of new houses for sale at the end of August was 235,000, meaning there is a supply of 4.6 months at the current sales rate. "While new home sales are helping homebuyers con - strained by low resale inventory," McLaughlin said, "the share of all home sales made up by new homes is still low." Competition for these houses is only expected to go up. "Demand should continue to grow, and industry growth will be limited by supply-side concerns, most notably lack of labor and lots," said Robert Dietz, an economist at the National Association of Home Builders. 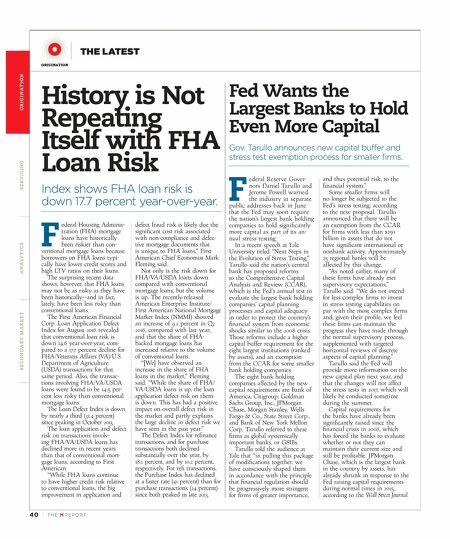 "The third 'L' of the supply-side of the market (AD&C lending), con - tinues to expand, with residential construction loans up more than 16 percent over the last year." In August, new home sales represented about 11.5 percent of all sales, McLaughlin said. This is less than half of the pre-recession average of 23.6 percent. This comparison suggests homebuyers aren't buying new homes at the rates older generations did, likely because fewer new homes are be - ing built at affordable prices. "The 12-month rolling total of new home sales were about 83 percent back to normal, but when taking into account the number of U.S. households, is only about 63 percent of the way there," he said. "Although it's been tough for home - buyers to buoy existing home sales because of low inventory, it looks like there is solid potential for new homes sales to run higher before the end of the current economic cycle." Realtor.com chief economist Jonathan Smoke said that the housing market did not take a turn for the worse in August as recent data might suggest. "In fact, we are seeing good signs that the new home market is finally growing substantially, with sales of new homes up big time over this time last year, and so far this year," Smoke said. "It looks like these gains are happen - ing because builders are shifting product towards more affordable price points, and responding to strong demand by building with contracts in hand. This August only 30 percent of new homes sold were already completed." Smoke continued, "Even with a continued lack of homes on the market, total home sales are up 4 percent over last year. That shows a clear shift in the composition of sales—new homes have more room to grow while existing homes are limited by their own - ers' willingness to sell."